Tomatoes vs Big Ag: Who wins? Who let Monsanto into the tomato patch? There are millions of Americans who do not know what a real tomato tastes like. They think it’s the crunchy, flavorless rock-hard orb that appears in the supermarket – and your expensive restaurant salad or sandwich — for nine months of the year. 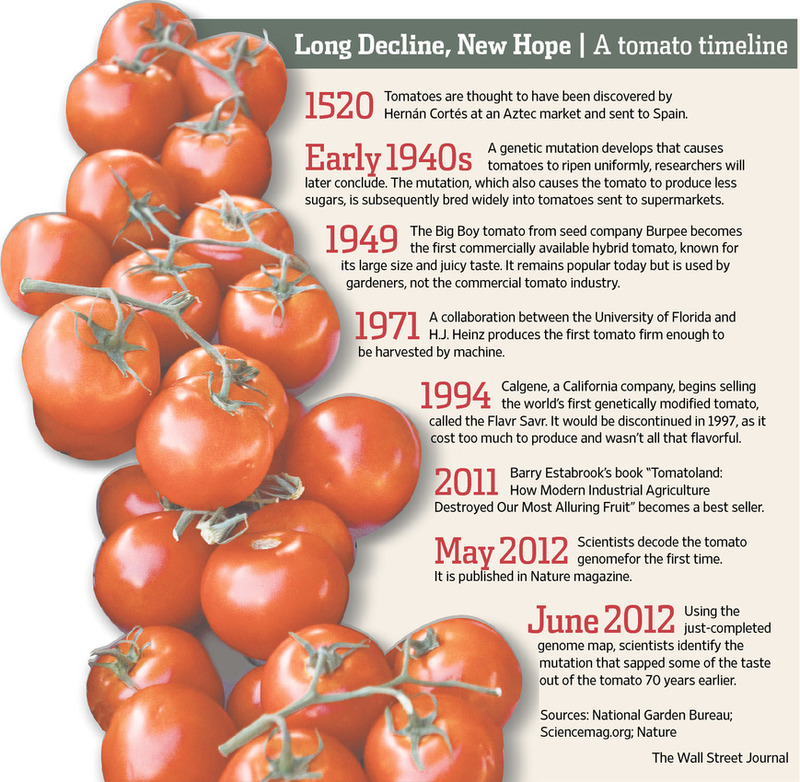 We’re savoring the last tomatoes of the gardening season, just as the Wall Street Journal published a whole section on “Innovations in Agriculture.” Which, because their primary market is Wall Street, means chemicals and genetic engineering. I grew up on a farm, so I know the agricultural industrial complex has helped multiply yields on crops from soybeans to wheat – and helped feed the world. I draw the line at fresh vegetables for human consumption. Big Ag has created monster vegetables and fruits to withstand the trek from field to market. And we’re all the poorer for it. He describes how tomato growers essentially bred the flavor out of tomatoes as a sacrifice to getting the tender fruit to market. That’s why you can buy tomatoes year-round. They may be hard as baseballs and utterly tasteless, but their red beauty draws consumers like Snow White to the poisoned apple. At least you won’t die from it. Draw the line at the end of the season. Swear off tomatoes until the next season brings around locally grown tomatoes that taste like…well…tomatoes. LIke these last offerings from our garden we’re slicing into: juicy, sweet, glorious. Not for nothing are they called love apples. We are too! Washed down with an Old Dominion Oak Barrel Stout. As usual, your blog post is spot on. Yes, tomatoes in season are the greatest. But January tomatoes from the not so supermarket are a waste of time and money. I recall from my tour of duty with the Army in Germany in the early ’70s that all salads were seasonal, and I grew to like the winter vegetable salads. I wonder if that tradition still holds true today? Kent, now that’s an inspiration — winter veg salad! What types of veggies were usually in it?